It’s been a while since my last post in the behind the renaissance faire scene series! But I’ve got a great interview to start back in. Lys has been a performer at the Scarborough Renaissance Festival, and if you like attending renfaires, you’ll love reading her answers. I enjoy peeking into this world. I guess that I should start with a little background first. I started attending renaissance faires when I was about 16 years old and living outside of Rochester , NY . 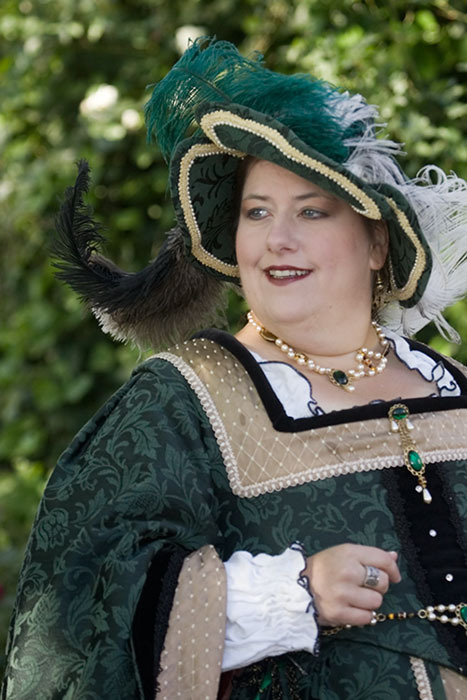 I would get tickets to Sterling Renaissance Festival at least twice a year at the beginning, and later bought a season pass, joining the ranks of the playtrons (festival-goers who tend to wear costuming and create a persona to play, but not employed by the faire). I remained a playtron until my husband and I moved to Texas . We were too late to audition for Scarborough that year, so we attended the Spring of 2001 season as patrons and then auditioned and were accepted into SAPA ( Scarborough Academy of the Performing Arts) for the 2002 performance season. We've been a part of the festival as performers and occasionally as instructors ever since. My husband still performs, though I am currently on a hiatus for a bit. Tell me what it was like to play a historically based character. Playing a historically based character is a challenge and a joy at the same time. I actually was quite lucky in that my character, Lady Gertrude Courtenay, Marchioness of Exeter, is not a very well-known personage. This gave me a bit more leeway than someone playing royalty or a more well documented person might have. The challenge comes in the fact that people can go back and research the person that you are portraying and pick apart what you are doing. So it is important to know your dates, names, and places. You have to be aware of how the person fit into history as well as how they will fit into the dynamics of your own festival. I enjoyed the challenge, though. Trudy wasn't really well represented in historical documentation of the time, so I had to fill in a lot of how she would think and act from what I've learned about women in the 16th century. It is always interesting to step out of the 21st century mindset and to think and react in a way that is period-appropriate. Apparently I did a decent job of it, because after I'd been playing her for two years, I read a biography of the Exeters that had more information than most, and it appears that I nailed her personality rather dead on the mark, which was fun to know! How do you get various parts (like the gentry or the court character)? Is it strictly audition based or if you play a character one year, do you automatically get to reprise it the next year? This really does vary from faire to faire. At Scarborough we have a pretty open character development process. You have to present your ideas to the Character Staff and they approve it or suggest changes. SAPA instructors try to encourage performers to create characters who would live in the Village first and foremost, but there are always going to be Court characters as well. You just don't want the Court to overshadow the Village, as the Faire isn't set at Hampton Court and the Royals and their entourage are just visiting. So it really does depend on having a good character outline and what the existing balance is between the various elements. Once you've played a character for a year it is generally assumed that you will continue that character until you request to change. It is preferred that you give any character at least two years. Your first year with a new character is always a bit harder, and most characters tend to gain more depth and comfort between actor and character in that second year. There are some folks who like to change characters on a fairly regular basis, and others who have played the same character for their entire time on performing company. Personally, I like to play my characters for a minimum of three years but not much longer than that. I enjoy creating someone new every once in a while and I enjoy taking the time over that three years to get to know them and grow comfortable in their skin. Performing company actors are responsible for providing their own costuming (something to remember if you want to play a Court character! It can get expensive quickly! ), but we answer to the Costume Staff in regards to whether it meets their guidelines for period-appropriate attire. There are obviously some concessions made to health and modesty, but overall I think that Scarborough 's actors do a pretty good job of being dressed appropriately. While I wish that I had the skills to create my own costuming, sewing is not one of my strong points. I am VERY lucky in that I have some very talented seamstresses in my corner, including MaritaBeth from "A Wardrobe in Time", Arianna Reaves, and Tommie Ealy. Those three ladies have made the bulk of my costuming. Oh, and I couldn't survive without Sharon from Dreamhats as headgear of some kind is a requirement for all performers. My sewing skills are limited to handwork and beadwork. Anything with a machine involved is beyond me! What is the most challenging part about performing at renaissance faires? Honestly, the most challenging part is the physical wear and tear. We're running around in extremes of weather while wearing around 30 pounds of fabric, and I do mean literally running at times. There are days when you have to cross the entire 35 acres of faire site in ten minutes while remaining in character and interacting with patrons. There is a constant level of energy used to project a cheerful attitude and while you work to keep everyone around you entertained, then you add in even higher energy levels expended in shorter bursts for things like sword fights and shows. Oh, and you do all of this while speaking in accent and using the appropriate language for the time period! It can be both mentally and physically exhausting. When you consider that in addition to the two months of performances the actors have two months of workshops before the Festival even opens, people get worn down quickly. Most of the performers work their day jobs for 40-60 hours per week, and then put in another 12 hours each Saturday and Sunday for four months straight. It's really no wonder that we nearly all end up having a love-hate relationship with it. It's hard to contain the excitement when a new season begins, and it's hard to keep from feeling relief when it is over. You end up loving every moment, but when it is over, it takes about a month to fully recover. But that's all right, because after you've rested for a couple of months, you start working the choreography for your fights for the next year, and it all starts over again! What is your favorite part about interacting with faire-goers? Every performer out there has their strengths. Some work best with children, others can get patrons to become a part of the most outrageously amusing moments, and some excel in entertaining dozens at a time. My own specialty is something that we call a "patron conversation", and involves engaging a small number of patrons in a more extensive interaction. Usually it involves simply talking to them as my character, telling them about my "life" in 1533 and answering their questions about everything ranging from politics to how to correctly eat your food. As Trudy is a Lady in Waiting to the Queen, I get a lot of questions about what a Lady in Waiting actually does...other than wait that is! I also get a lot of questions from women about what a woman's role is in 1533, and believe me, it can be a lot more involved than movies and television make it appear. I love getting people interested in history, and I hope that somewhere, somehow I've gotten at least one person interested enough to continue digging further into it on their own. Sometimes it happens with people you might never think would get the spark. I sat down one day with a couple of young men who, on first glance, seemed the least likely to care about what I had to say. They were college-age, had about five empty beer cups apiece in front of them, and were just looking around at everyone and everything with amusement. I had a conversation that lasted over two hours with them, and covered everything from life at Court to the daily routine of a Lady in Waiting. When I finally had to leave as I was scheduled to be somewhere else, I left them in the company of three other performing company members and they were beginning to delve into the subject of seafaring in the 16th century. THOSE are the moments that keep me going when it is pouring rain or one hundred degrees out. Seeing that interest get sparked, or the light on a little child's face when they give a hug to the lady in the pretty dress, or having someone get to laugh even if it is just for a moment, they all add up to a pretty powerful drug. I guess that's why so many people do it for year after year despite the expense and the exhaustion. The people who work and perform at Renaissance Faires are people, like everyone else. We have our moments of sadness and our grumpy days, just like anyone. The difference, I've found, is that for the most part Ren Faire Folke know how to set aside those feelings and do what they're there for, which is to create a magical experience for everyone who comes through the gates. We're there to build a world that allows people to escape for a while, to live in a time and place that may only exist in our imaginations but is full of joy and caring. Thank you Lys for taking the time to answer my questions. I've learned a ton, and I definitely appreciate the work that performers put in for us faire-goers a LOT more!